There are a couple of methods to do this I initially used the nightly webkit but eventually found chrome was easier. One thing for sure is that WebGL is a heck of a lot faster in Chrome than in Safari, especially with multiple windows. So I still recommend using Google Chrome over Safari for WebGL stuff on Mac. These days Chrome is on version 13 and has WebGL enabled by default so it does not need the step below. Although I did find that some functions are not supported (possibly depreciated), I cannot say for certain. If you like Google Chrome and like me use it as well, you can download the Beta which is available on the google site: Google Chrome BETA this version (Version 9) has WebGL support. 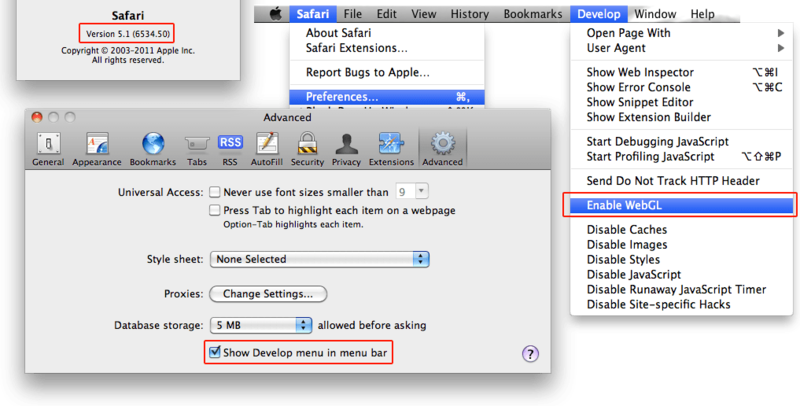 I hope you find this is a worthy solution to getting Web-GL working on Mac. I find the first method is the best for most people because you only need to use the terminal once to write the defaults file, after that the nightly webkit just works. Now Using the Nightly Webkit build to play around with WebGL making some cool things yet to come. thanks for describing method 2 with Chrome. Googled my way here, … but now realise I can use standard build; turn on developer menu via prefs, then in ‘Develop’ menu there is an ‘Enable WebGL’ option. Thanks for this i’ll update the post straight away.. 🙂 I noticed that WebGL still runs faster in Chrome though.